Streak’s core target personas are sales organizations who want to work inside Gmail. The other CRM platforms are targeting personas use any email platform. Stating the obvious is seen as refreshing and can give your brand the image of being a trustworthy brand. 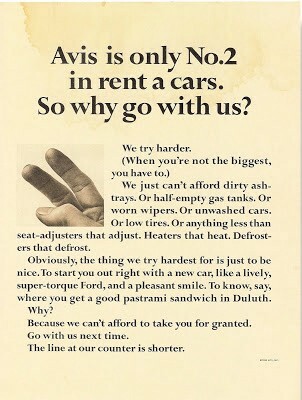 Avis’ sales grew as a result. A marketing-based first-movers advantage still holds because if your potential customer used your product before any of your competitors then you will be perceived as the “first” in your customers’ eyes. With that in mind, Salesforce is usually the first CRM introduced to most new tech workers-sales, marketing, and business operations. I was introduced to Salesforce at my first tech sales role and if you review most sales role applications “Salesforce experience” is a requirement, not Streak, Base, or Close.io.